“This here is a green thumb,” he says, slowly ticking off the list on his fingers. “I grow corn, cabbage, green beans, weed, tomatoes…..” Yep! He said weed. We are in Colorado after all. Don’t you just love small towns? Don’t ya love COLORADO!!! There’s such an amazing feeling of family and security when you’re wrapped up within the tight walls of a close knit people that make these small communities run. That’s one of the many things we have cherished about exploring Colorado. So far, in every place that we have made our home for a few weeks in this rocky mountain state, we’ve truly felt welcomed. We have met many of the good folks that live here and proudly call Colorado home though surprisingly, most of the people we’ve talked to aren’t actually from here. Some visited time and time again on vacation and just decided to stay. The massage therapist we met at a coffee shop said she was from California but told us that she’d asked the spirits where to go 15 years ago. The next day, she opened the newspaper and read the ad that would later lead her to the job she’s still at now. Steve, the line cook from Indiana, came to Colorado with his girlfriend to attend college. 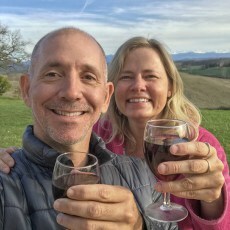 They split up shortly after arriving but by then his love affair with the Rockies had began and now, 6 years later, the mountain biking, skiing and lack of humidity keeps him here. Rick, an old cowboy landed here right after he left the Army. He said his car broke down 20 years ago giving him the sign that this is where he was meant to be. 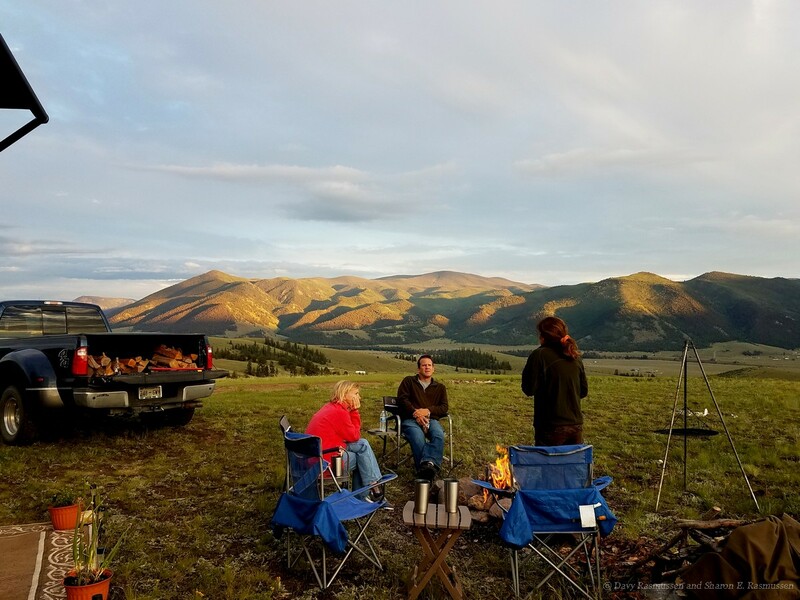 We also love all of the dispersed camping that is available here within the National Forests and Wildlife Areas that allows free camping for up to 14 days. Our solar panels makes living off the grid easy-peasy. Our home on the mountain for 2 weeks. I guess our favorite spot to boondock so far has been right next to the small town of Creede. The day before we made the drive towing our 36 foot fifth wheel, I called the Chamber of Commerce to get the exact directions on where we could fill our tank with fresh water. I was connected to Ralph, who was full of kindness and super helpful. He told us that Creede provides a public sanitary RV dump station, dumpsters and potable water all for just a donation. If you’re traveling in your RV and prefer the freedom of dry camping, you know how awesome a find this is. 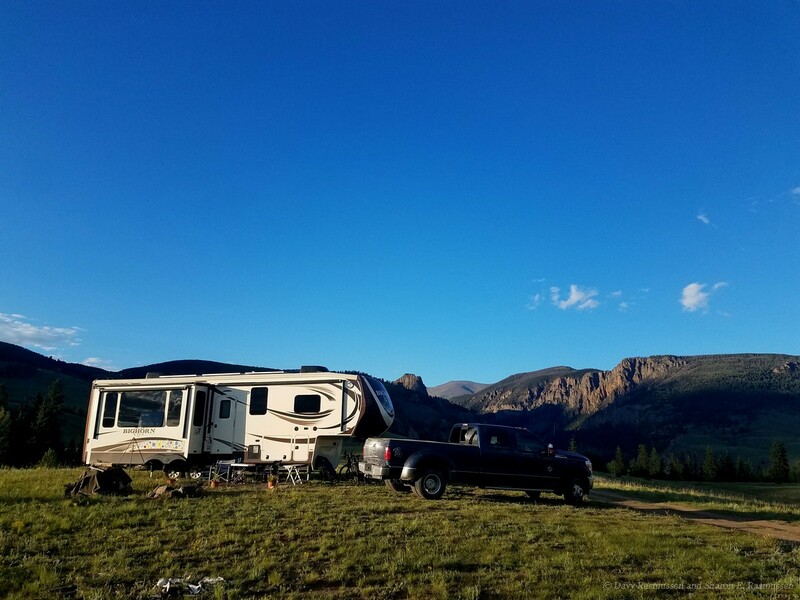 We had driven to Creede from our last boondocking spot a week or so ago to meet up with our RV friends, Ron and Liz from Texas who were staying close by for the month of July. 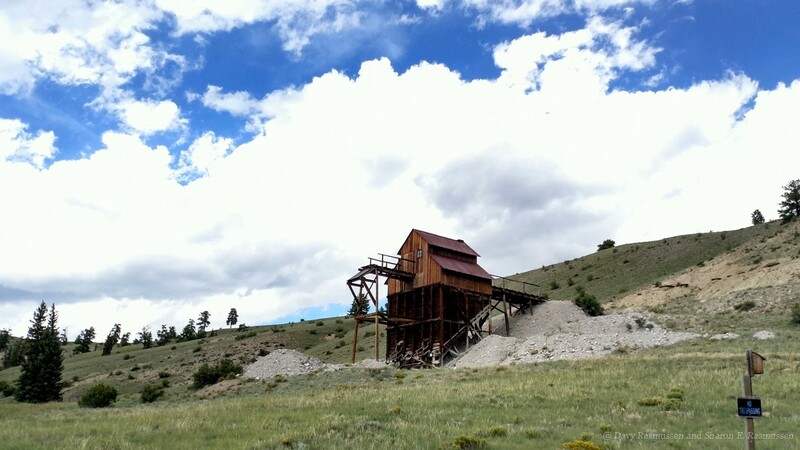 We met them for lunch and they invited us to ride with them on the 17 mile Bachelor Loop Historic tour that requires 4×4 and winds its way through Creede’s 1800’s mining district. So, when we came back with our rolling home in tow, we already knew that we wanted to spend more time in this quaint mountain town. We stopped by the cute little community garden in town and met JT and Greta who moved here after retiring 30 years ago. As they showed us around their prized planted vegetables, they shared some of their own stories. They told us of how the winters can be tough but the 400 residents that live in Creede year-round pull together and help each other out. The small grocery store lets them order in bulk in case the delivery truck doesn’t make it over the pass in the winter. We could tell from the way their faces lit up when they boasted about the town having a professional Repertory Theatre that they loved their home. I’m not sure how the conversation evolved, we were talking about the river, people of Creede, past and present, and somehow the trail of stories led us to a prom night when 6 high school students were in a horrific car accident and Greta literally held a young man’s scalp on his head until emergency help could arrive. 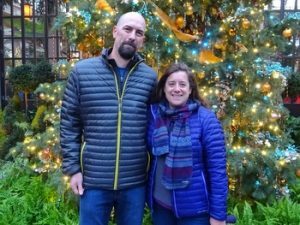 We felt their passion for their town and had no doubt about the love that welds together all the four-season neighbors that survive and flourish here year round. I think I actually started feeling like I was one of them. We didn’t want to leave and could have listened to a dozen more heartfelt stories, but the sun was setting. Our friends Greg and Cori (The Restless Youngs) came to share our mountain with us for a week and during that time we explored the Creede museum, hiked many trails, saw a play at the Repertory Theatre, went jeeping on the Alpine Loop Trail and frequented Kip’s Cantina where you could have a drink and chat with locals while you wash your clothes. On one such delicious day, while we were sitting at the bar waiting for our clothes to dry, (I just love saying that) we struck up a conversation with the guy sitting next to me. He was another whom had come to town as a teenager and stayed. We mentioned that we were dry camping in the National Forest and how grateful we were that the town of Creede had the RV dump station and fresh water for travelers. Imagine my surprise when he introduced himself as Ralph. He was the first voice of welcome from Creede that I had heard on the phone and now he was sitting beside me. At some point in our “laundry drying/beer is cold” banter his 9 lives came up. We down the last of our Colorado mountain spring water and for some reason we each give Ralph a hug. We then mention that we were gardeners at one time. I tell him all about my Tennessee mators and all the great green things we could tickle to life from seed. Ralph leans over and interrupts my rambling. “Oh, I’m a gardener too and I grow a bit of everything.” Holding up his hand he points to his thumb as his face lights up with a mischievous grin. “This here is a green thumb,” he says, slowly ticking off the list on his fingers. “I grow corn, cabbage, green beans, weed and tomatoes….” Yep! He said weed. We are in Colorado after all. Small world, small town, great minds, Good people! How I love the wild west. We ran into Greta and Ralph a lot during our 2 weeks in Creede and each time we felt like we were a part of their family. We’ve since moved on to another sweet little boondocking spot and are looking forward to getting to know the locals and exploring the history and personalities of another historic Colorado town. We called Colorado home for over twenty years and loved every minute. Between raising kids and work obligations, we unfortunately didn’t get a chance to explore Colorado’s backcountry as much as we would have liked. But I’m grateful for the time and explorations we did muster. Thanks for taking me back. We actually purchased our RV in Poncho Springs seven years ago … my how time flies! 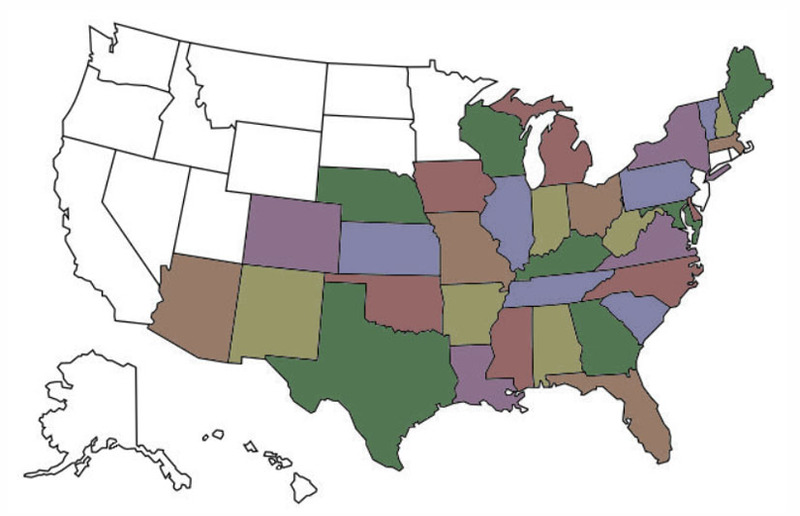 Sounds like another addition to our “list” of places to visit! Thanks for the heads up! 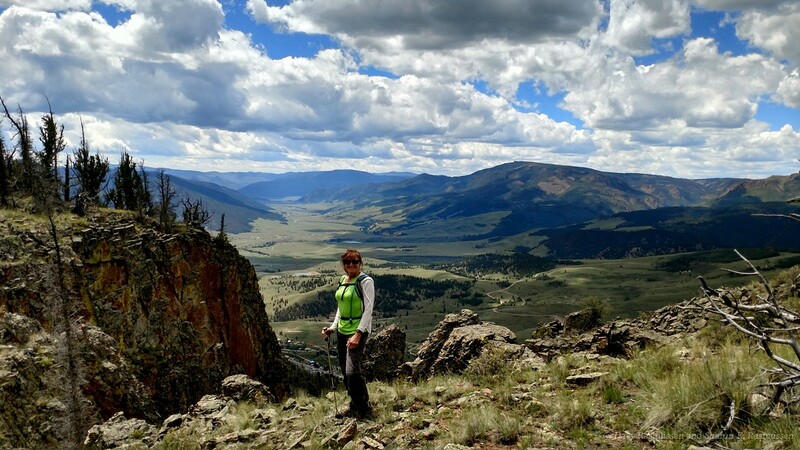 We loved Creede too! Yet another gorgeous place to visit! Thanks to you and your blog from last year, we found our next favorite small town in Colorado. Salida!!! We loved it there as well. I would love to do Laundry with Bill there!!! We’d have a blast! Cori took the amazing Moose shots, so she’s up to write about them!!!! So sorry that we didn’t run into you. 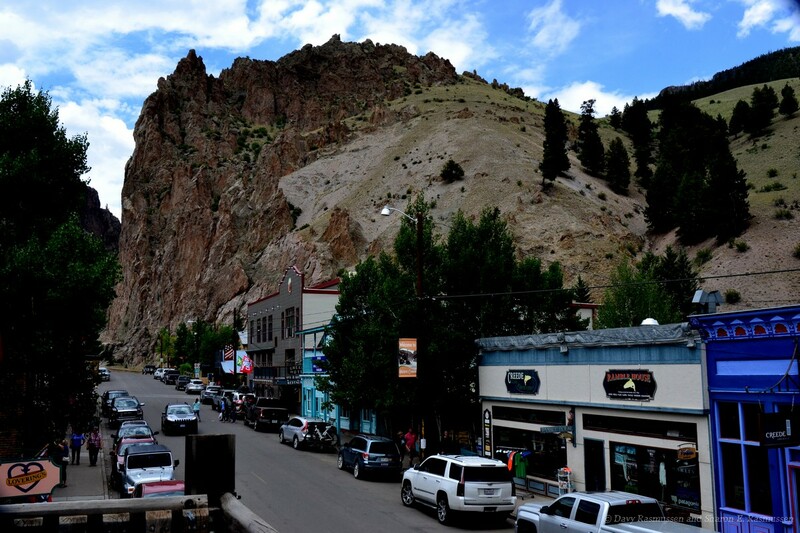 We were in Creede for the week of Labor Day and found it a very welcoming and friendly town. We have been traveling since leaving the rally in Sevierville and found Creede to be one of our favorite places in the Rockies. Isn’t this a wonderful life !!! Yes!!! It is a wonderful life. Where are you guys now? We are here in Colorado for a few more weeks. Maybe our paths will cross again. Cori, you took all of the amazing Moose pics, so I’m leaving that one to you! But, they were truly a sight to see and yet another serendipitous Restless Young/Rasmussen moment….just by a random hello to a stranger and we were led to two Moose sightings!!!! !